The South Asian box or Malayan Box Turtle (Cuora amboinensis) turtle gets its name from the ability to box itself up completely within its shell. This is due to the hinged lower shell, which, like other box turtles, can be folded up when the head is withdrawn, securely protecting the animal from any predators. It can grow to over 20 centimetres in length which makes it the largest of the Asian box turtles, which all belong to the genus Cuora. 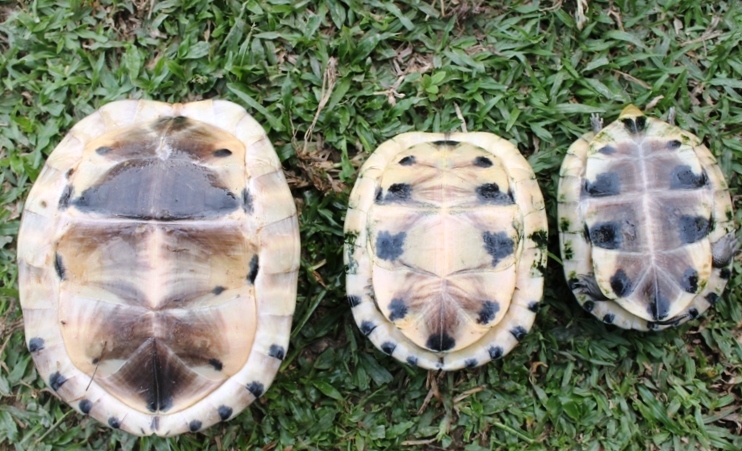 The highly domed upper shell, or carapace, is dark olive or black, whilst the lower shell, or plastron, is yellow to light brown, with large dark-brown or black patches toward the outside of each scute. The smallish head is olive to dark brown on top, yellow to olive underneath, with three distinctive black stripes running along the side of the head, from the nostrils to the neck. It has a protruding snout and slightly hooked upper jaw. The limbs are olive to black and large scales cover the front of the forelimbs. Males can be distinguished from females by their longer, thicker tails, and their slightly smaller size. 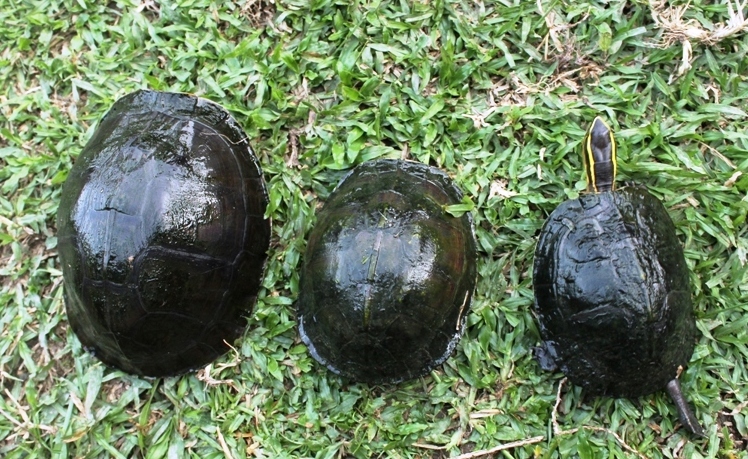 Can grow up to length carapace: up to 21.6 cm. The South Asian keeled box turtle is primarily nocturnal and spends most of its day hiding under piles of leaf litter along banks of streams. It feeds on a wide variety of foods, mainly aquatic plants, but also molluscs and crustaceans, and fallen fruits, fungi and soft invertebrates, such as worms and slugs, when on land. 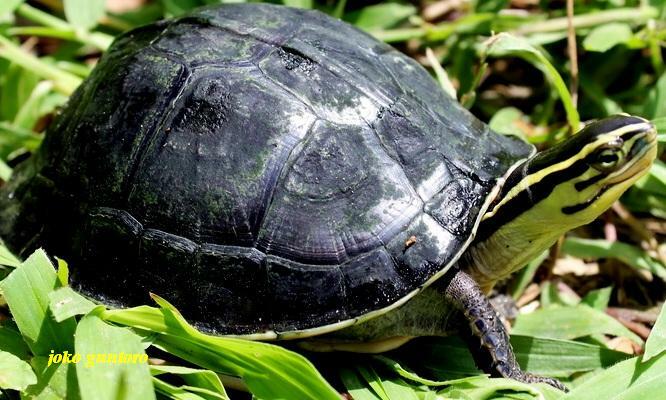 Turtles play a central role in their ecosystem food chain, through predation, and as prey for other forest animals. They have been observed performing interesting courtship behaviour, whereby the male and female face each other, and with outstretched necks they move their heads in the shape of an infinity symbol. However, the male has also been observed being very aggressive during courtship, chasing the female and biting her on the neck. Sometimes males attempt to mate with each other, which results in violent fights. The nesting seasons are in January to February, and April, during which time around two to three brittle, white eggs are laid. After 67 to 77 days of incubation, tiny hatchlings appear, only up to 5 centimetres long, and contrary to adults which spend as much time on land as they do in the water, juveniles are entirely aquatic. In many Cuora species, the survival rate of hatchlings is reported to be very low, as hatchlings, as well as eggs, are an important food source for monitor lizards, herons and some small mammals. This is likely to contribute to the low reproductive rate of box turtles. They reach sexual maturity after four to five years and have a life expectancy of between 25 and 30 years.